Are you looking to improve your voice, move forward with your singing, or make it a bigger part of your life (or even your career)? If so, let me tell you about three ways you can work with me in 2019. The Artist Within programme has been running for about a year. Through the programme I work on your voice, mindset and accountability – so you can achieve all the things that you want to do, but didn’t think were possible. We really dig deep, using the principle that when you really tap into the artist inside you it becomes much easier to create goals and plans and put them into practise – even with a busy lifestyle. You’re a serious musician, and want to take your singing to the next level. You need a plan to get there! One singer launched her part-time singing career within six months of leaving a corporate job, and is now doing shows and playing clubs. She didn’t think it was possible. Another is an actress. She’s been on lots of TV, but she wanted to have more versatility with her voice. She was able to create a demo showcase for her agent that meant that she could actually be put forward for different positions or different options for her career. A third singer on the programme has dropped his work week down to four days created his own recording area. He’s rehearsing his band and getting songs ready to go out to publishing companies. The Online Singing Academy is an online membership, with regular live group coaching, 12 months of video training and other learning content, and a private community with support from myself and a group of wonderful singers. You can learn in your own time, from the comfort of your own home. If you think it’s not possible to actually have that one-to-one specific help online, then please be assured, it absolutely is. 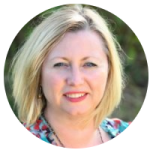 I’ve been training people, one-to-one, for several years now online and it’s just as effective and often very much more convenient. In the vocal assessment I’ll listen to you sing and look at what’s going on with your voice, give you useful feedback and create a plan of action for you. Send me a recording. If you have some singing already that is recorded, you can send it to me to assess. Have a video call. We’ll arrange a mutually convenient time and have a call over Zoom. All you need to do in order to get more information about any of these or to claim one of the 5 free vocal assessments is to email me, angela@angeladurrant.com. Looking for more support, guidance and encouragement with your singing practise? Join us over at the Online Singing Academy. How important is posture in your singing? Answer: very! And the reason why it’s so important is that one of the biggest subtle problems that will affect your tone and your tension is your posture – especially your head and neck alignment. If you’re seated every day at work (whether it’s at a computer or – like me – at a piano!) it’s especially easy to start slouching. Your shoulders roll over, the neck comes up, and you end up with an incredibly bad posture just for your everyday back alignment – let alone for singing. So I’ve got five different ways to help you improve your head and neck posture today. To start to stretch those muscles out, pull them in a better direction, and help you to see a difference in the way that your tone is coming out, or in the way that you’re articulating your sound. The thing that is constricting you is not the note, and it’s not your talent: it’s your posture. You need to develop your understanding of how sound works and flows through your body, and your ability to put your body in a position that will enable sound to vibrate and resonate more freely. Your whole body is a supportive structure in your singing, and singers often don’t really pay that much attention to it. For example, if you’ve got a microphone in front of you, you will probably be pulling your head forward as you sing. That can cause immense problems with strain, tone – and even pitch. Problems with your back muscles, the anchor muscles in your shoulders, and down into your intercostal muscles, and even your lower abdominals, will all have an impact on your singing. But the first thing that you need to know is about proper head and neck alignment. Take a neutral posture and then put your thumbs on your clavicle and your fingers under your ears. Stretch up in between and you will probably feel all your back muscles really stretch, especially if you’re used to slouching. Just do a little bit of a stretch into that and feel that. Now take those fingers and just pull up from the back of your head slightly. Feel the stretch in the back of your spine. In this position you can move around and feel that softness and how much your head will turn further to the left and right when you’re just lifting up behind the back of your ears. If you can feel that pull down the back, that’s a clear indication that you’ve got slouching shoulders and some muscles that are overcorrecting. If you’re in that normal, safe position and you can feel that stretch down the back of your spine, that’s fine for singing. Your head and neck posture and alignment can be different if you’re singing different styles of music. For example, if you’re a classical singer, you can afford to drop your chin very slightly. The reason is that this actually lowers the larynx and the voice box, which creates a typically classical sound. If you’re doing pop or contemporary you can afford to lift your head, but only very slightly. Now, I’m going to say a caveat here: when you lift the head in pop music, the first thing that tends to happen is that the chest comes forward, the neck takes a lot of strain, and the back of the neck is crooked. So the most likely thing that’s going to happen if you are singing popular contemporary is that you’re going to feel an enormous amount of strain, a tight tummy and a lot of extra pressure and constriction around the laryngeal area, vocal folds and swallowing muscles. It’s going to cause you to feel very tight and constricted in your tone. So, where does the pop or the contemporary singer position their neck and head? If you are doing stronger upper middle singing (belt), you’re going to want to be in a slightly anchored or raised back position, where you can feel that the top of your spine is a little bit longer. Raise your chin, neck and back muscles. Stand and lean back slightly, so you’re drawing yoursed up a little bit taller and not collapsing in the middle. This will keep your whole vocal tract and resonance area free for that sound to keep vibrating as you’re singing. Getting some awareness around your own posture can be really insightful and provide a starting point for you to start to change it for the better, or find someone to help you improve. Use a mirror Can you see your own bad habits? Not unless you can see yourself! So put a mirror in front of you and you can start to see what’s going on with your posture. Record yourself singing on video and play it back. Watch yourself singing and pay attention when you’re doing certain phrases. What are you doing with your head and your neck? As you go to a top note, do you pull your chin around and go forward? Do you tighten the shoulders? If after watching yourself you can see what you need to change, brilliant! Go change it. If you don’t feel it works for you (or it throws up other problems), then you need to find a vocal coach. When you’ve got correct posture, it will not inhibit your larynx production, vibration or how your sound is being produced. Sometimes we need somebody to help us correct our posture. If you’re struggling with posture, it’s invaluable to have somebody give you feedback, so that you know exactly how to improve. Notice a big difference in your singing! Remember, you are the instrument. Paying attention to that instrument, understanding how it works and taking care of it is going to make a big difference to how effectively you’re going to be able to use it. This is the fourth and final part of my miniseries about the four stages of learning. In Part 1 we talked about getting competent; Part 2 was all about getting confident. Part 3 was about how you go from ‘good’ to ‘great’ as a singer. What lies beyond greatness and mastery? Think of Dali, the painter. By the time he was able to put two or three brushstrokes on a canvas and sell it for millions, and was hailed as a great avant garde painter, he was able to paint everything already. He was a master at his craft before he was an artist. Stage four is called Artistry. But what is artistry? And what is the difference? Artistry is when you can now take your mastery of your craft and reinvent it. You can break the mould and innovate, breaking boundaries and barriers. You can take what you do and really pour your own true self and your personal expression into it. You might be thinking, people are able to express themselves before they get to vocal mastery level. You don’t have to be able to do every sort of vocal trick known to man to become an artist. And I would say, absolutely. But while mastery is being able to master the level you’re at and what you need it for, artistry is a pinnacle. Artistry is where you can create anything, because you can put your voice to anything. Jon Bon Jovi was once asked in an interview what the highlight of his career was? When did he know that he’d made it? He looked at the interviewer and he said (and I paraphrase), Well, the thing is, I have had incredible highlights to my career. There has been this gig and there has been that concert, and there was that album, and there was that number one single. But if I felt that that was the top of me, the top of all I am, if that was all I was ever aiming for, then what’s the point of continuing? But there’s still more in me left to give. There is still more in me left to explore. You see, creativity is the impossible made possible. It is the uniformness energy that flows through life, coming through you in your ability to actually create at a level further than you have before. So often with think that mastery is about making it, and that once we created a career, or an album we will have got there. Not at all – artistry is about going for your full expression, whether that is seen by millions of people, or by a few minutia of people. Whether you never do anything with it, or whether you express it to the world, at some point when you’re singing, you’re going to want to feel as if you’ve given your all because you can. That’s the place of artistry. It’s the place where you’re finding your unique expression in the world. Is artistry about age and experience? Not necessarily! I’ve known violinists that are artists at 25. They’re so fine at their expression. Then with other people, such as Strauss, they write their last and greatest works at the age of 80. It’s not necessarily an age thing, but it’s always, always a decision. It’s a decision that you will go forward, and you will just not stop. If you’re an artist in your blood, and you decide to take another step and another, you will, at some point, find your own artistic expression and reach the pinnacle of artistry. What stage at you at in your singing? Where do you see yourself, right now? And where do you aspire to go? Do you know where do you aspire to go, but you’re too afraid to admit it? Are you happy to stay at your current level, and take the pressure off – because actually it’s more about a different level of enjoyment for you right now? There is no right and wrong. There is no reason to go to any other level – other than that little nudge inside you that pushes you forward; that little voice of wisdom that’s saying, Come on, take the next step. Come on, it’s time to step into stage one, two, three or four. If you’re ready to listen to that voice, it’s a foregone conclusion that you’re not going to stop until you have found your full, true expression. All you need to do is take the next step… and the next. It could be to simply just watching more of these videos, allow it to just seep into your mindset, and being prepared to take the next opportunity that could be waiting for you. It could be to join a choir. It could be to download some new vocal exercises. It could be to come in and join the Academy and start the process of moving towards confidence, competence and beyond, learning how to find your own goals and vision, and the challenges and stretches that will push you forward. Are you already confident that you really need to make a decision that’s going to shape your destiny? You see, there is only today. The saddest thing for me is to listen to people that come to me when they feel it might be too late, who say, I gave up because life got in the way. I didn’t take the opportunity. I thought it was too late for me. I thought because I failed once, that I had just failed. Or, because I’m not with the right teacher. Or, I didn’t take the right route. None of that needs to stop you. All you need is to understand what your process is, what your plan is, what your next step is, and I can help you walk through to get you to the next level. So, follow that inner nudge. Your whole voice, your whole dream, your whole passion is truly at stake. You can have what you want, if you know what you want. It can be the most enjoyable adventure to find your voice, create your creative expression world, enjoy every portion of your singing, and even leave a legacy for others to be able to step onto the ladder after you. Where might you go if you really step in? This is the third part of my miniseries about the four stages of learning. In Part 1 we talked about getting competent; Part 2 was all about getting confident. Part three is about how you go from ‘good’ to ‘great’ as a singer. Stage three is called Mastery. Mastery is where the prodigies live. The people who seem to have what we call ‘natural talent’. They might develop that talent very quickly as a child; sometimes they come to that talent later as an adult, but they deliver it quickly. But it can take twenty or thirty years to become a master. You see, mastery is going from good to great, becoming a virtuoso in what you do. At this level you’ll be performing at an incredibly high standard. You may well be a soloist, or the leader of a band, starting to get more well known for your expertise in your area. When you are at the Mastery stage, you are using your instrument (be in a musical instrument or your own voice) with great skill. Sometimes mastery shines through in song writing skills. So, is it something you should aspire to? Well, often it is, but it might not come for a while. And having potential isn’t a guaranteed route to mastery. It is not a given! But it is a journey of discovery – a kind of hero’s journey – where you move forward in order to really find out where your potential might take you. So, how do you go from good to great in your singing – from competence to mastery? Mastery is about the detail. It’s about listening more deeply and with more clarity. You’re looking for the difference that makes the difference. You need to take yourself back almost to a beginner’s mentality, re-hone your skills and reshape them as if you’ve never learned them before. You need to make a commitment to learn at a deeper level. What should you do if you feel you want to push for Mastery? Don’t kid yourself; be aware of what level you’re really at. If you feel that you should be achieving mastery by now, but have been let down by a teacher or method, remember it might be that you haven’t recognised your true level. If you suspect that you’re being impatient, and trying to move forward before you’re ready, then hold back and put all the proper steps in place first. You see, it is possible to fast track this, but you can’t miss out any of the steps. You must go through them all. You must earn your stripes and get those things your muscle memory before you can truly take your vocal training to a deeper level. In Stage 2 I said it was okay to camp out in Confidence for a long time – even forever. A lot of singers do, and enjoy good careers. It’s not always possible for a singer to progress to Mastery, as not everyone has the right skills to reach that level. And that’s okay! Acknowledge that you might be holding yourself back. You might be stuck due to your beliefs about yourself, your background, your opportunities (or lack of them), your environment, or your own habits. Sometimes unconscious self sabotage keeps us stuck in the same place. If you are holding yourself back, it’s time to face the challenge. At this point, you need to work one on one with a mentor, at a much higher level. You need to push the barriers, and push yourself further. What challenges will you face at Mastery level? Years ago, when I was kind of hiding out in Confident level, one of my vocal mentors challenged me to take my voice to the level of mastery. I admit I was scared to take those extra leaps. When you’re already good at something, the prospect of actually choosing to go back almost to a beginner’s mindset, to let go of what works in favour of learning something new, creates resistance. So prepare not just for physical and creative challenges, but for the mental challenge of showing up and breaking yourself down to build yourself up again. You’re going to need bucketfuls of perseverance, determination and egoless commitment to the learning process. How will you know when you’ve reached mastery? And you’ll find that you start to develop a love for detail and for going deeper into your own subject matter than you ever have before. When you find yourself approaching mastery, you geek out on it a little bit. You’re passionate about it. In fact, it oozes out of every pore of you. It’s that at this point you are sold completely on what you’re doing. You live and you breathe it. You can’t stop yourself. It’s no longer good enough to be enough, or to do it better than you did it before, or even better than those around you. If you’re ready to move on to Mastery I wish you every success. And wow! There’s going to be something amazing that comes out in the world when you hit mastery level. This is the second part of my miniseries about the four stages of learning. In Part 1 we discussed becoming competent in your singing: not being perfect, just getting up and being competent enough to do your thing, regardless of your feelings around it. And once you’ve achieved Stage One, you’re already on the fringe of Stage Two. Stage Two is the ‘Confident’ stage. In the Confident stage, you’re not just getting by, you’re starting to achieve a higher standard and find some consistency. It’s time to move the dial a little further. You’ve now passed the stage at the beginning where your resistance was so huge. You already have skills that you just developed in the competent stage, but you now need to make those skills stick. Stage Two is a good stage: it’s where you start to get good at what you do. And confident is a very interesting place to be. When you start to hear people saying, “Ooh, you’re a good singer. Ooh, you know that was a really good rendition of that song. That was a good song that you’ve written. Oh, that was a good performance,” you know that you’re in that Stage Two arena. Getting good at what you do is a fantastic place to be. It can take you a long way: it can get you solos; it can get you into choirs; it can even get you paid work. It can get you into writing songs, or going into a recording studio, or getting good enough to go at auditions and succeed. What it is NOT is a miraculous leap forward, where everything work out and nothing ever goes wrong! How long should you stay at the Confident stage? You can stay in Stage Two quite a long time – and many people stay in this stage forever. It’s a place where you can perform or write or create at a consistently good and fairly high standard. There’s an interesting book written for the business world called ‘From good to great’. The premise of it is that actually at some stage ‘good’ becomes your enemy – it gets in the way of you becoming great. But many professional musicians are at this stage. Teachers can be at this stage, be good teachers and create healthy careers for themselves – and help a lot of other singers also at Stage Two. So being (or sticking) at Stage Two doesn’t mean that you’ve failed in any way. It’s a great place to be. And once you’ve mastered Stage One (Competent) I want you to swim around in the Confident Stage Two pool as long as you need to! It’s quite a big pool and actually there’s not always that many swimmers in there. So you’ll have plenty of space to master your strokes, build your stamina – and make a splash! You can say yes to opportunities that before you may have said no to simply because you were unsure of yourself. Your voice is consistently working at a good standard – no matter how you feel on a daily basis, you can do your vocal exercises and create an environment where you will perform consistently well. You can take advantage of last minute opportunities. If somebody asks you to sing pretty last minute, you have the confidence in your ability to be able to take up that opportunity. This is the first of series of four posts on the four areas of learning: Competence, Confidence, Mastery and Artistry. I’ll be sharing how to know where to focus your energy and effort so that you can make the right choices going forward, and avoid holding yourself back from the next level. Competence is having just enough skill to do the job in hand. Many people are hobby singers, or they’re just stepping onto the platform for the first time. Their first goal is not to wow the crowd and find an agent. Their first step is to get competent: to show up week after week, do the exercises, lose the nerves, move forward, get things done, write the songs, put them out there. And by doing all this, begin to see transformation work in the voice. This first area of competence is really important. Because although it’s your first stage, and maybe your first tiny step onto doing what you can do with your voice, it can actually be a really dangerous area. Because your resistance to your ability, to unlocking your greatest potential, is going to be the biggest at the beginning, and right before a breakthrough. At the beginning, you might find you’ve got more self-talk, you’ve got more reasons to walk away and not to move forward. This is when we start something, dip a toe in the water, then realise there’s a commitment involved. We know that something needs to change. Our habits need to be reset. The first stage of getting competent is about consistency. Consistency in showing up, time and time again. At this stage, you’re probably going to only shift the dial a little bit, and see a few results. There probably won’t be enough of a result to make you feel as if you’ve suddenly broken through every barrier in your singing! It’s about not saying, “I just couldn’t! Because life got in the way this week!” Well, hello, you’re human. Life is happening every single day. There are distractions, bright shiny objects, social media. There is work, children, traffic on a daily basis. That is going to happen. You have to get yourself in the game, and find a little bit of momentum. Sure, you’re going to find loads of objections. Sure, you’re going to find loads of little resistances. But if your dreams are going to happen you need to find that consistency. It’s the only way that you are ever going to find your true voice and be able to do something with it. So here’s the choice you need to make: if you want to achieve competence, you need to choose to build better habits. Let’s face it, we’re all human. If it was easy to break your habits, and to move into your desired result, more people would do it. So what’s the difference for those who actually do manage it? The ones who actually have that breakthrough, get competent, and move forward to the next stage of learning? They understand that time is finite, they understand that there is no such thing as tomorrow. They understand that the first stage will just be the smallest shift forward – but that getting there will show them what to do next. And that once they’re competent at this thing, they can move on to the next stage. Do you feel that you are competent in your singing? If not, it’s time. You can get competent. You can. You don’t have to have variable results. You can be consistent and competent at that first rung of the ladder. So turn the dial. Move it that one degree, and watch what happens when you do. Are you the kind of person who can learn things quickly and remember them very well for a short time (perhaps for an exam), but would struggle to recall anything in detail a month later? Or are you the type who takes longer to learn something, but still remembers it years afterwards? And how does your memory impact on your singing? We use the front part of the brain for last minute cramming. It’s about taking in and regurgitating information. Singing is more about recalling a feeling. If you feel certain pitches in certain places, you’ll experience where the pitch is and you know that you can go back to that feeling again. Somebody I taught once said to me, “I’m listening for a feeling… I know that probably sounds weird.” I can understand why she thought it sounded odd – because what kind of sound does a feeling have? But there is a tangible inner memory that your body can recall: that place it operates from when it’s you’re working at your best capacity. There’s a tangible sense, there’s a tangible flow and a tangible energy around it. Because when you’re learning a musical instrument or singing, you’re using a different type of memory: your muscle memory. Take tennis players. When tennis players are playing at the top of their game, they might not be able to remember what they did in those moves and in all those moments during their practise. But all those shots that they did and didn’t make, all the small adjustments that they did took them bit by bit to a place of working out energetic balance in what they were doing to get from here to there. Singing is very much like that. Sometimes we see something we want to achieve, say, a new song, or a particular area of the voice that we want to work in, and we see a kind of vague picture of the end result. It has a feeling. We’d like it to sound like this. We’d like it to feel like that. It’s as if we’re standing on the jetty and we can see Paradise Island that we’re trying to reach. But we just don’t sometimes realise how far away it is. We judge we need this much fuel, but then we get halfway and realised that our perspective was off and we really need this much fuel. When we become more experienced we become like the good captain of a ship, who can look at the waters after they have sailed the same seas back and forth for years, and even when the sea seems calm, can feel the direction of the wind and know that there’s a storm brewing. When we are learning, some ‘storms’ that come up are not necessarily very obvious to us. We suddenly reach something that we just haven’t got the skill to do and we need to learn how to navigate towards it – and train our muscle memory as we go. Are you missing this key element? Our early experiences of learning can condition us to learn with a cramming mentality. When I had to sit exams I would use my photographic memory. I could imagine a picture of the pages in my mind, go into the exam and start to write them down. But when you learn in that way all you’ve got is information. You’re missing a key element: implementation. When you’re learning to use an instrument (including your voice!) you need to add the element of daily practise so that you can store the information in your muscle memory and recall it at any time, at will. Think about your PIN number. Can you easily repeat your PIN out loud, or do you need to move your fingers to recall it? If you’re in the second camp, that’s your muscle memory at work. But what if you’ve inadvertently stored the wrong information in your muscle memory? You’ll be playing that misinformation out, and not getting the results you want. Sometimes it’s a case of rewiring your muscle memory: you need to search out new information at that point to retrain, the neuro pathway. You need to find the right techniques and exercises to practise on a regular basis so you can store the right information in your muscle memory – and start moving closer to being able to recapture that feeling time and time again. What is a singing warm up? What does it do? It might seem an obvious question, but it’s important that you understand what your warm ups are designed to do, in order for you to make the transition from beginner, through to intermediate, through to advanced. First and foremost, your warm ups enable you to improve and coordinate your muscles. It’s just like training for dance or athletics. If you can’t coordinate your singing muscles, you’ll find yourself using tension or incorrect muscles, or too little or too much breath pressure. When you are practising I want you to think about how you’re coordinating your muscles. Where are you not coordinated? Where is it breaking in the middle? Are you getting into the top stretch of the voice? Where are you off pitch? Are you lifting your chin to the ceiling? A good warm up practice teaches you how to tune into pitch. Learning how to listen to your inner ear is what warming up is about. So what is pitch? Pitch is when you say, “I can’t hit the notes”. But where is the note? And where are you going to hit it? We don’t even realise that the language we use is telling us that we are seeing this from an outside-in perspective, when really it should be seen from an inside-out perspective. You’re not going to find a really exceptional singer with a major pitch problem. Why? Because they know how to listen. They’ve been paying attention. They’ve been doing it consistently. They know what they’re aiming for and they’re developing their oral skill. Your outer ear is the one that you’re trying to look up to see – looking for notes that live on the ceiling! But of course they don’t live on the ceiling, they’re only ever vibrating and resonating, and living in your own head. It’s just that when you get to hear the sound, it’s already bounced back off the walls around you. That’s the speed of sound in physics. You’re never listening to sound that you’re making. You’re only ever listening to sound that you have created. So let that one sink in as a bit of physics in action for you. Close your eyes and hum a few notes. Can you hear the sound in your inner ear? You learn to sing by feel first, and then develop the understanding to back that up. As a singer you start to know where you feel different sounds. You grow to understand the movements, the feelings and sensations in your body. You’re doing that based on pitch, and feel, and balance. It’s a little like being on a bike: you just know which movements to make (and there’s no way of doing that unless you are actually on a bike). Your warm ups will help you get to a point where you can really feel your voice. Your aim is to be able to use your voice as a tool – to understand the mechanism and the movement of that mechanism. If you warm up and practice in the right way, if you ever lose your voice, if you understand the mechanism and the movement of your voice, will understand how to get it back. An effective warm up routine helps you to really get to know your voice, tune into it and focus on what you need to do to improve. It’s a space to remove all your negative thinking and prepare mentally for your practise session. Your warm up should be working your breathing, working your posture, working your body. It’s bringing your voice into balance. You have to listen, feel and coordinate. That’s the whole point of warm up exercises. The process that you have to do is fall in love with it, so it becomes a joy not a chore. You want to get to a place where that whole thing starts to work into balance. Effective warms up will help to improve the quality of your tone, your stamina, your range and your strength – over time. The problem is when you want that in a heartbeat, when you want it handed on a plate and when you want someone to wave a magic wand. This is a process, and there is no fast track to get you there. Regular practise, beginning with an effective warm up, is the foundation you need to build a strong singing voice. 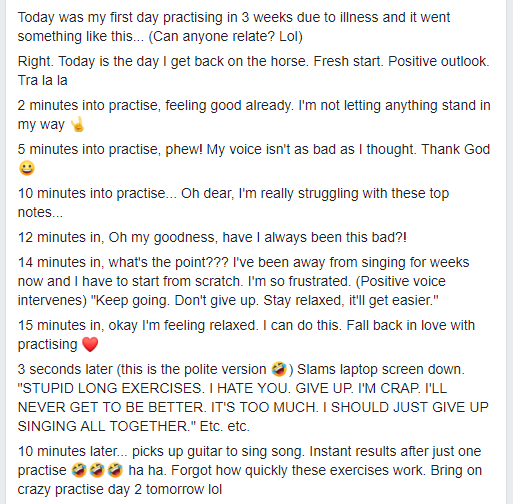 I want to talk to you about a brilliant (and funny) post that was put in our Online Singing Academy Facebook group. I started the Online Singing Academy in February last year, and this week I’ve given myself time to sit back and reflect on how it’s going. Who are the people I’m working with? How have they been helped? What are some of the journeys that they’ve gone on? And where are they right now? And this week one of our academy members shared a very funny post in our private Facebook group. I laughed my socks off when I first read it – and so did everybody else, because not only was it true for this person, but when I shared it with my private one-to-one clients they all smiled a wry smile, and admitted that they often experienced similar. The incredible power thought has in shaping our reality. I’m so grateful that this person posted this. Because isn’t that the mental journey that all singers are on, whether they are being coached one-to-one, or learning online? Now what caused that song to actually work well in the end? Was it just the exercise? Not necessarily. What exercises do when you’re practising (a bit like when you are exercising your body) is that you are able to become more aware of when things are tense. When things are free. The tone changing, clearing up, improving, becoming more precise. The top notes changing. You become able to actually control some of the functions and mechanics of your singing voice. How you listen. How you feel. How you hear. But exercises are not the magic wand. The secret is in the the power of thought. This person was able to just allow their thoughts to be present. They didn’t try and get rid of the bad feelings. They didn’t try and only have good feelings when they were practising. They didn’t hate the exercises, or love the exercises. It was neutral. Even though they felt like it was the exercises that did it, it was only because they brought themselves to the exercises. They brought their presence. They brought the commitment and the consistency and the just the getting in there and doing it. They didn’t have to bring good feelings. If what you need right now is permission to rediscover your voice, or to allow your thinking to settle down and to get back in the game, then take this as your permission slip today to do just that! Until next time, keep getting out there. Keep singing. Keep sharing. Keep showing up. One of the things that I’ve found with the Academy is that it’s very much about discovering – or rediscovering – your voice, and finding the right way to bring it out into the world. The magic is not in a guru. The magic is not in a set of exercises. The magic is in supporting each other on the journey that we choose to take when we begin to work on our voices. We are creating a community of singers that have the courage and vulnerability to share their journey and their struggle with others. And to find affirmation that you are not alone. If you’re ready to take the next step on your singing journey, click here. Today, I want to talk to you about singing higher. Now, I’m not coming at this from a usual angle, so bear with me. What I want to talk about is why we struggle with singing higher – what’s really going on. Go on YouTube and you’ll see so many videos telling you how to sing higher. How to belt your notes. How to sing this, how to sing that. So much about singing higher and increasing your range. And yet, you’re still struggling. With such a huge amount of information out there, why are you still struggling with singing high notes? Because fundamentally, you’re not looking at high notes with the truth of what they are. When we think of high notes, one of the biggest problems is that we’re imagining all our notes outside ourselves. We hear our sound inside our bones, and as an echo back from the walls around us. We don’t always come to things with the perspective of physics or the perspective of how things really work. But unless there is something physically wrong, the capacity to be able to actually stretch the voice out and increase range is common to all humans. So, what can you do to prove this to yourself? There can be a lot of baggage around the jargon of singing. Even the phrase ‘high note’ has some baggage around it: we imagine that something that is high is out of reach. So what are we likely to do to try and bridge that gap? We’re going to make some effort as if we’re lifting heavy weights. We’re going to strain and stretch. But is the note actually out of reach? Well, no it’s not. You need to rediscover how you can make singing easy for yourself by understanding some ways that we use our voices outside of singing. Understanding how the voice works and bringing simple exercises into the mix can help you understand singing in a different way. Watch the video from 04:23 for the exercises. When you do these exercises, you notice things suddenly feeling so much more doable – because there’s less thinking. You create those sounds all the time, every day, in your talking voice. Because we don’t think it’s difficult, we allow the voice to work as it was naturally intended. We think the thought; the voice responds and moves into position; we create the sound. We’ve learned it by habit, by copying, by nature. When it comes to singing, you need to stop striving. Are your high notes really high? Or are they just a new space? Are they just new positions that you need to feel and find and experiment with? Allow your perspective to shift towards listening from the inside out, and shaping and creating those sounds from the inside out. Once you’ve got a handle on that and you’re not striving and straining for something outside yourself anymore, you can start to harness your voice in a more artistic and creative manner. And a more healthy one too. So, until next time, have fun experimenting with your talking voice, with different sounds, and allow that to inform a new perspective on your higher range notes. I’d love to hear how you get on!